Chanteur Country US né Barton Lee Hazlewood, le 9 Juillet 1929 à Mannford (Oklahoma). Il a notamment écrit pour Nancy Sinatra (These Boots Are Made For Walking ou Summer Wine qu'il interprète en duo avec elle, repris en France par Gilles Marchal et Martine Habib), découvert le guitariste Duane Eddy et a apporté son aide pour le lancement de la carrière de Phil Spector … Lee est décédé le 4 Août 2007 à Las Vegas (Nevada). Country and pop iconoclast Lee Hazlewood has been one of the music world's most irascible geniuses during a long, fruitful career. An Oklahoma Dust Bowl refugee who grew up to become a dedicated Europhile; a production heavyweight who authored success stories for Duane Eddy and Nancy Sinatra but also a recording eccentric who refused to acknowledge mainstream tastes; a songwriter capable of crippling fatalism ("My Autumn's Done Come") and playful country corn ("Dolly Parton's Guitar"), and songs that use elements of both ("Dark in My Heart"); it's all part of the highly contradictory legend of Hazlewood. 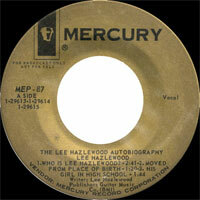 Hazlewood was born Barton Lee Hazlewood in 1929 in Mannford, OK. (A 1968 recording even took his birthplace as its title.) His father, an oil man, moved the family around continually during the 1930s and '40s while looking for work — with stops in Arkansas, Kansas, and Louisiana — before landing on the Gulf Coast in Port Neches, TX. Hazlewood enrolled at Southern Methodist planning to study medicine but was conscripted soon after; he married his high-school sweetheart, Naomi Shackleford, then spent several years overseas, spinning records in Japan for Armed Services Radio but also on active duty in Korea. With success came a series of complications, however, beginning with Eddy's decision to produce himself, after an argument concerning royalties. Then, Sill began focusing his patronage on Spector in the wake of his increasing production acumen during the early '60s. While the duo formed their own Philles label, Hazlewood was having little success with his productions, which included another brief stint with Eddy, longtime friend Al Casey (who a moderate hit with "Surfin' Hootenanny"), and his own folk-pop group, the Shacklefords. 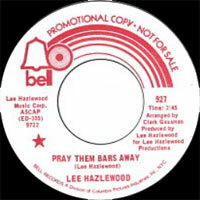 In 1963, Hazlewood booked some time at Western Studios (site of a few Brian Wilson/Beach Boys classics) and recorded the tracks for his first solo LP, Trouble Is a Lonesome Town. 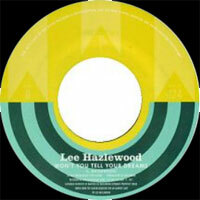 A concept record centered on the eccentric residents of a small Western burg, it introduced Hazlewood's distinctive performing talents. A keen observer of human behavior with a talent for storytelling, he dryly told despairing tales of hard-bitten small-town characters and prefaced each song with a few knowing words about its subject. It wasn't a formula for pop success, but Mercury A&R man Jack Tracy believed in the record and released it with little interference. After a year-long break from recording of any kind, he returned to the studio in 1965, when asked by Jimmy Bowen from Reprise to produce Dino, Desi & Billy — a trio of Hollywood teens with royal blood (the first two were the sons of Dean Martin and Desi Arnaz, respectively). 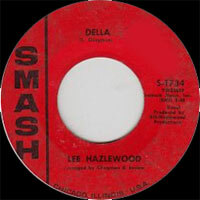 Hazlewood recorded a pair of Top 40 hits, "I'm a Fool" and "Our Time's Coming," and one of his compositions, "Houston," was recorded for a hit by Martin himself. Reprise showed their gratitude by allowing him to record his second LP, The N.S.V.I.P. 's ("The Not-So-Very-Important People"), during 1965. Also, Hazlewood was duly apportioned the career of Nancy Sinatra, another blue-blooded child who had been at Reprise for four years without earning a hit. 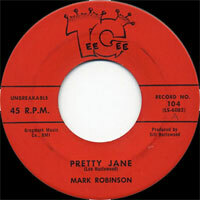 By the end of 1965, she reached the pop charts with "So Long Babe." One year later, Sinatra became an international superstar thanks to the cultural milestone "These Boots Are Made for Walkin'." 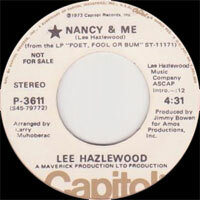 Hazlewood's other production chart-topper was "Somethin' Stupid," featuring a duo with Nancy and father Frank. 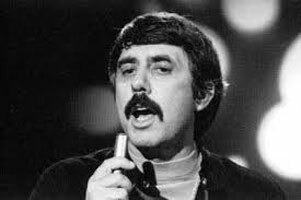 After another record for Reprise (Friday's Child), his publisher found him a contract with MGM, and he released two LPs in two years: 1966's The Very Special World of Lee Hazlewood and 1967's Lee Hazlewood-ism: Its Cause and Cure. 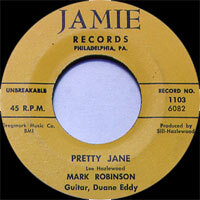 (A planned third record, 1968's Something Special, wasn't actually heard until decades later.) These two comprised the best work of his (solo) career, a collection of desert-dry ballads of the dust boasting a healthy dose of Western fatalism and wanderlust and given impeccable productions that ranged from cowboy minimalism to overblown brassy pop. They were also a place to flesh out material he would later produce for Sinatra, like "Sand" and "Summer Wine." 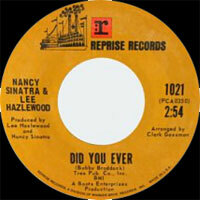 When the latter, a Nancy & Lee duo tacked onto the B-side of a 1966 Sinatra single, became a hit one year later, it sparked a full-fledged duo album. 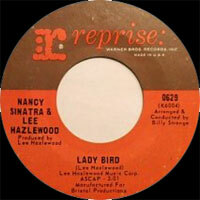 Nancy & Lee sold a million copies during 1968 and earned its place as one of the most influential records associated with either Sinatra or Hazlewood; "Some Velvet Morning," a haunting hymn to the twilight, became an alternative classic thanks to airings, not as much by contemporaries (Vanilla Fudge, Gabor Szabo) as by second- and third-generation inheritors (Lydia Lunch, Thin White Rope, Slowdive, Primal Scream). Also in 1968, Hazlewood the solo artist returned (briefly) to Reprise to issue Love and Other Crimes, another vaguely conceptual record featuring some solid material (though little to compare to his MGM work). 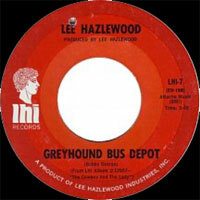 He also formed his own imprint, LHI (Lee Hazlewood Industries), which most famously signed the International Submarine Band featuring Gram Parsons but later refused to release Parsons' contract so his work with the Byrds could appear on the country-rock classic Sweetheart of the Rodeo. 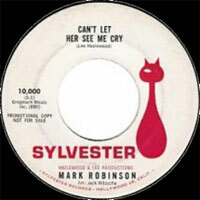 His own LHI debut was 1969's The Cowboy & the Lady, recorded with another female foil, Ann-Margret. 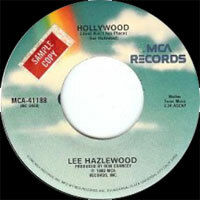 Increasingly, though, Hazlewood appeared restless in Southern California, recording a few sessions for country stars (including Eddy Arnold and Waylon Jennings) but gradually spending more time in Europe — especially Sweden. During 1970, he recorded Cowboy in Sweden, the first of several collaborations with Swedish director Torbjörn Axelman. 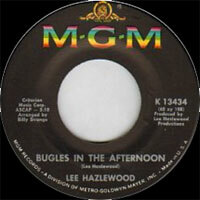 (Hazlewood even earned a Golden Rose at the Montreux Festival in 1973.) 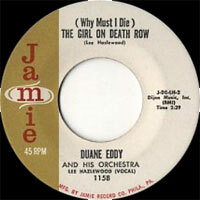 The same year, Requiem for an Almost Lady etched onto wax his breakup with Suzi Jane Hokom, who had duoed on several of his MGM singles. More and more, his records weren't even being released in America, though he continued to do solid work — 1973's Poet, Fool or Bum was one of the best of his career. After his recording career began drifting during the late '70s, Hazlewood retired briefly but resurfaced in 1995, touring America with Sinatra after her comeback album, One More Time. He also contributed two Vocals tracks to the Casey album Sidewinder, recorded in Phoenix and released in 1995 by the German label Bear Family. Since his peak in the late '60s, however, Hazlewood had been revered by figures in the alternative scene ranging from Nick Cave to Tindersticks to Lambchop. In 1999, Smells Like Records (founded by Steve Shelley of Sonic Youth) began reissuing several of Hazlewood's classic LPs and also released his first new album in 20 years, Farmisht, Flatulence, Origami, ARF!!! and Me... In the mid-2000s, he was diagnosed with terminal renal cancer; nevertheless, he released a new record, Cake or Death, in late 2006. The end finally came on August 4, 2007.